B) Clean and de-clutter certain areas in my kitchen that are badly in need of some attention. Here is the first of many recipes I’ll start with. 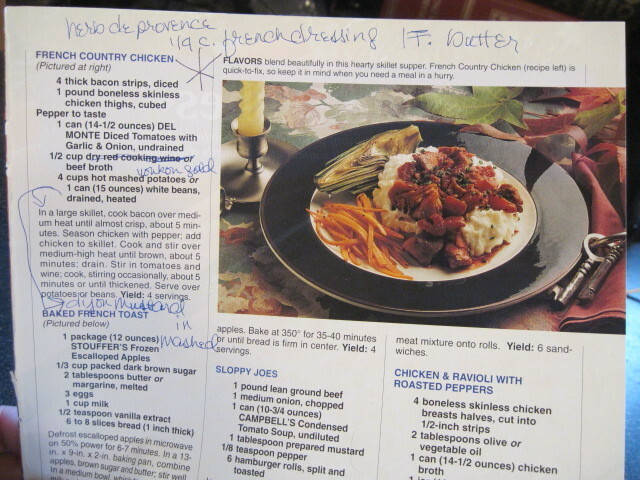 It’s a main course comfort food for French Country Chicken and it was superb! 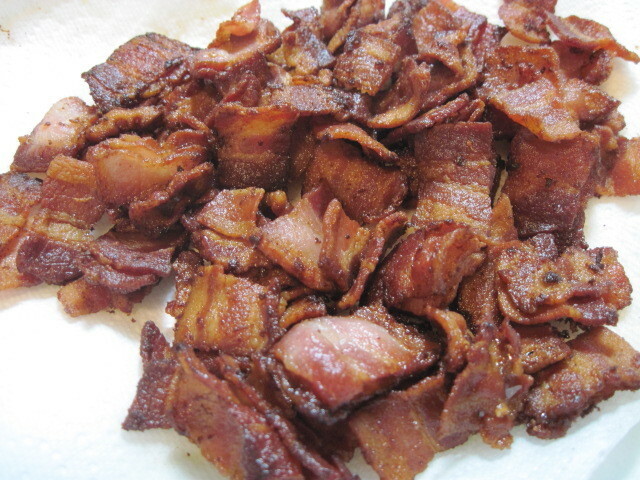 -In a large skillet, cook the bacon over medium high heat until almost crisp. Remove from pan and drain on paper towels. -Salt and pepper the chicken thighs and cube into bite size pieces. 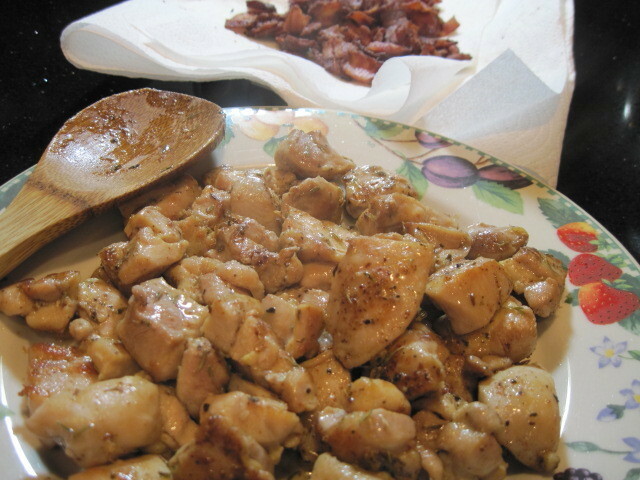 -Drain most of the bacon fat from the skillet but leave a little in the pan to brown up the chicken thighs. 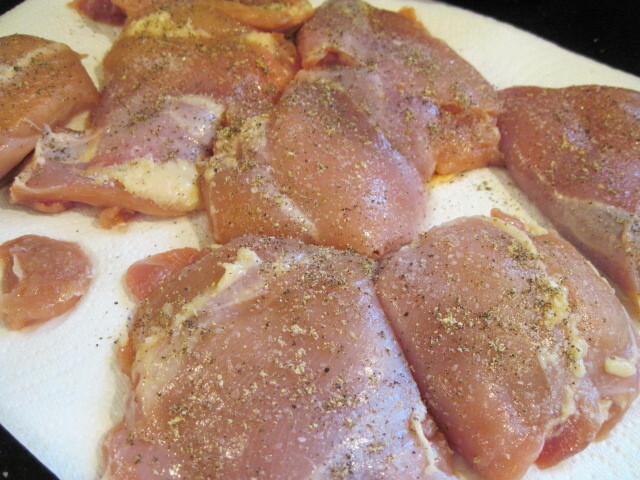 -Working in batches, over medium high heat, brown the chicken just to get a good color but not to fully cook through. 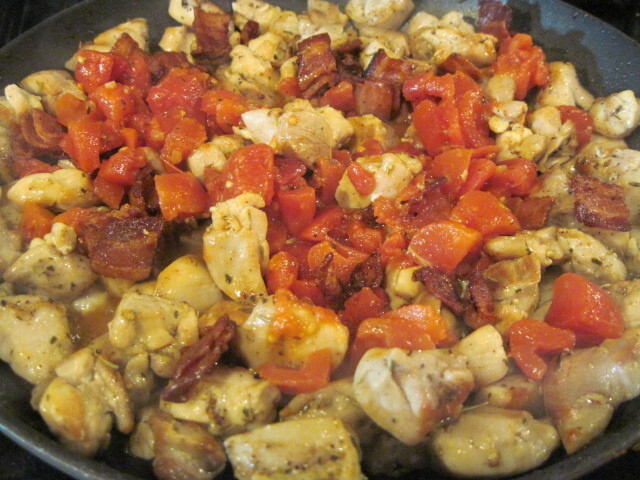 -Add the browned chicken, cooked bacon and the can of diced tomatoes back into the skillet on medium low heat. -Stir to combine and then add the herbs, beef stock, French dressing and butter. 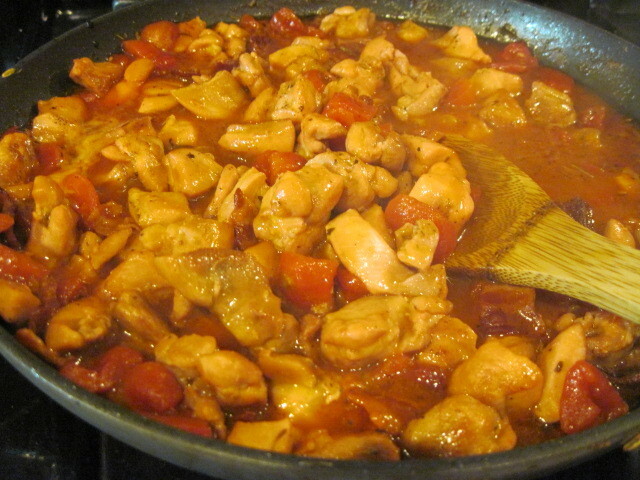 -Simmer on medium low for 10 minutes until the chicken is cooked through and no longer pink in the center. -Stir the Dijon mustard into the hot mashed potatoes. 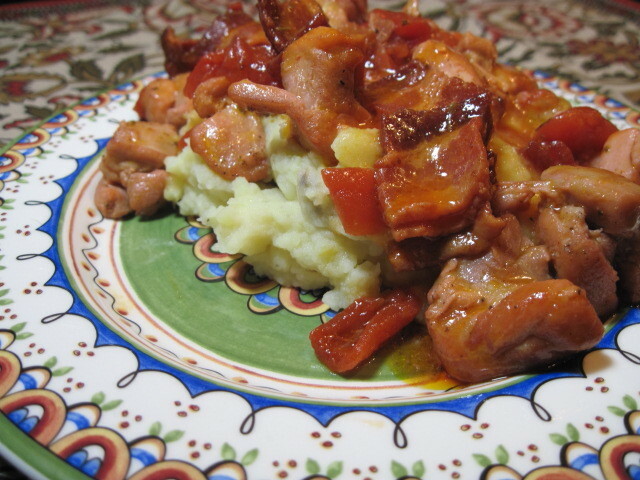 -To serve, place a helping of the potatoes on a plate and top with the chicken and sauce. Come again, won’t you? There is always something cooking in my Kudos Kitchen just for you! YUM!!! I just had dinner but my mouth was watering looking at this. This is my type of food. 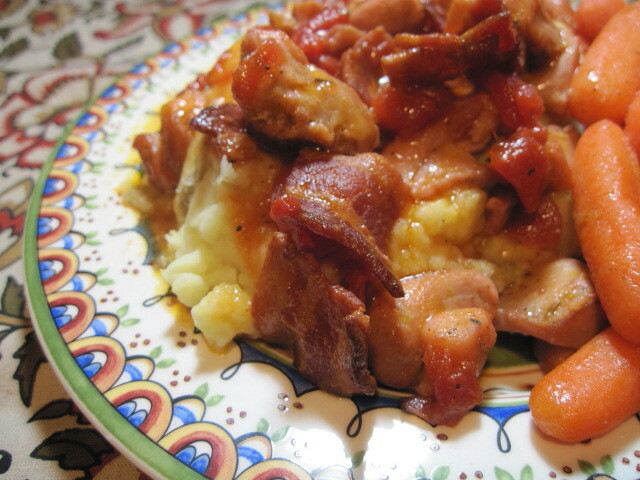 Not only do i love all the stuff you put in the chicken but your potatoes look fabulous, and with the skin on – Love it!! 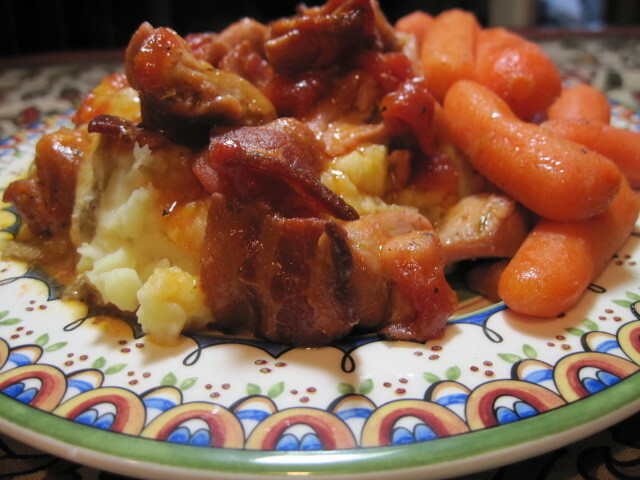 Two of my favourite meats are in this dish! 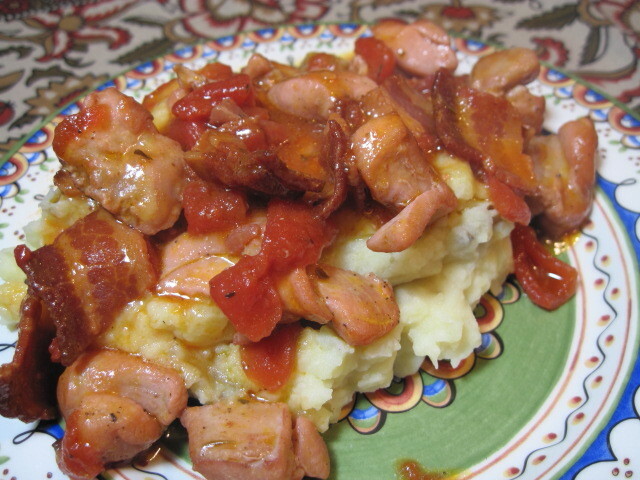 Looks wonderful served over the mashed potatoes. Bet it is good served over a bed of wild rice too! With all that bacon in it one could get away with having it for breakfast too! 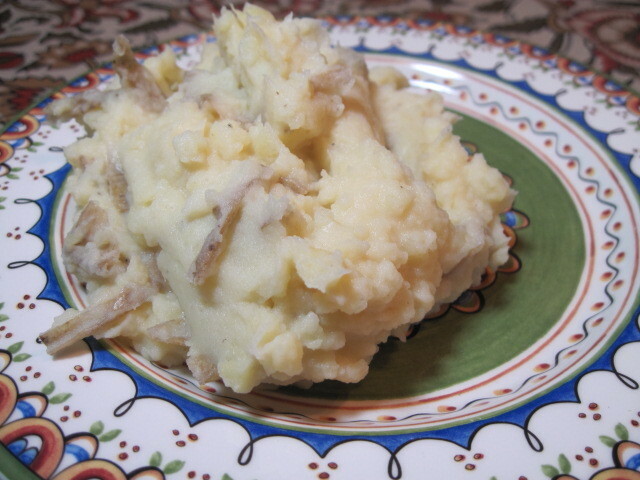 Looks like a really tasty chicken dish, especially over the mashed potatoes! This looks so freaking good. And yes…pure comfort food! Frankly im a bit envious. Of the people you are feeding!! !